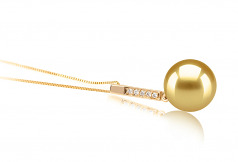 A soft and satiny golden South Sea pearl dangles from a 14K yellow gold pendulum bail, adorned with five, round clear crystals. 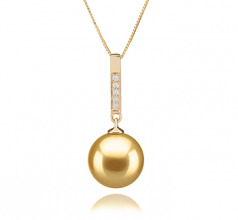 This perfect and unblemished, AAA grade golden pearl is on the larger size, measuring 10-11mm. Light striking this amazing pearl generates a muted and warm golden glow and is a dressy style that goes well with business, semi-formal, and formal attire. When wearing the Janet pendant with a white, open neck, silk blouse, you get a classy and sophisticated look that takes you from office to business dinner with ease. Add the Janet pendant to black, and you have a richly polished look that’s always in style. Keep it for yourself or give this graceful and striking pendant as a bridesmaid gift or a “something new” gift for the bride. Show only for "Janet Pendant"